This girl is something special. 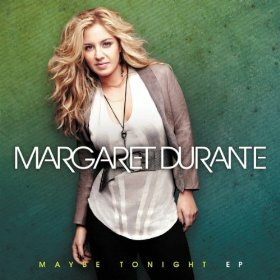 Margaret Durante caught my attention with her last single Mississippi’s Crying . Something about her voice and that song captured my attention and really made an impression on me. The song didn’t pan out as big as I thought or maybe had hoped. Now Margaret is back with a new song and single and it looks like more of a good thing from this rising country singer. Maybe Tonight is about young love. A girl is falling for this guy and really wants to make the impression on him tonight. There is no more waiting around for things to work out. She’s taking control tonight and making this guy fall for her. The melody is fun. The music is catchy and easy to listen to. The track makes you smile. It’s weird, but the song feels like love. That’s a pretty good accomplishment for a song to match the spirit of the lyrics this well. And I have to compliment Margaret on the vocals for Maybe Tonight . This kind of song doesn’t seem to need much vocal attention on the surface, but Margaret does well to showcase her country voice on the track just enough to make you notice, but not too much to make things feel out of place. I’m still hoping Margaret becomes a star in country music. The talent is there and a song like this could be the one to push her through on radio and make country listeners take a second look.